Live Performance : How to hire me to play guitar for your gig! How to hire me for your gig! All of the things I get to do as a musician, I think live performance is still my most favourite things! 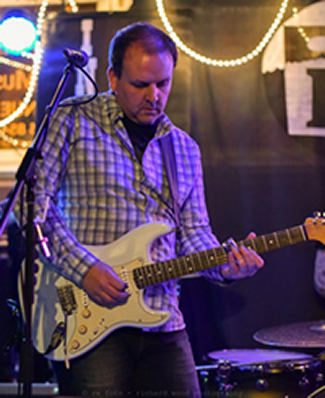 As a professional musician, I've done everything from cafe style solo gigs to big stages with 10 piece bands in places as diverse as Canada, Europe and the Middle East. 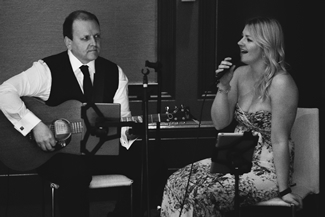 I can fit in to any line up and am equally at home on electric or all types of acoustic guitar (steel string, classical, dobro, 12 string etc) and can also bring excellent lead and backing vocals to the table. I'm also an experienced band leader and have been the manager and MD of a successful function band for the last 5 years. I have lots of experience hiring and organising musicians for gigs, writing arrangements, compiling setlists and liasing with venues and clients. If you're a band leader in need of another act to fill a double booking, get in touch with me today! "John has the technique, knowledge and experience to come up with killer lines every time, regardless of style or genre. Over three albums and countless live performances there's been nothing like the confidence of having John in the band." In addition to my playing skills, I also operate my own well spec'd PA which is availiable for hire with me as a player or just as your sound engineer. If you're interested in booking me for your gig, you can call or text on 0779 654 7711 or get in touch via the form below. Fill in the form and I'll get back to you as soon as possible. Alternatively, you can call or text me on 0779 654 7711. You can upload files using the contact form but if you'd prefer, you can send files via WeTransfer. Please use info@johnace.co.uk as the address if you're sending files via WeTransfer.